Tenderly illustrated, the attractive images found within the Blossoming Coneflower Cling Stamp Set will provide you a multitude of crafting options with their ample sizing! 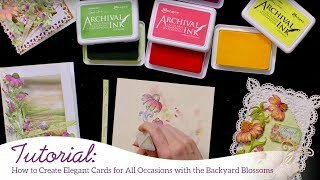 Excellent as main focal images for card fronts on which to showcase your impeccable coloring skills, or as shaped die cut embellishments for accenting scrapbook layouts, these favorite perennial backyard blossoms will bring a touch of airiness and feeling of summer to all of your paper crafting projects! This cling stamp set is part of the Backyard Blossoms Collection and pairs with the Blossoming Coneflower Die.